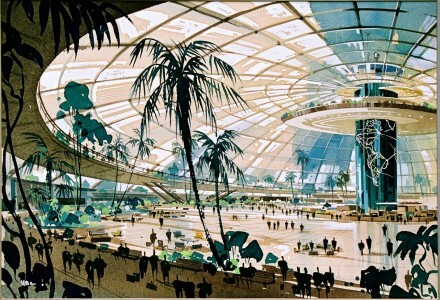 Imagine if this 1952 proposal of Pereira & Luckmar’s centralized circular glass dome terminal building for LAX, complete with an inviting concourse of palm and banana trees, had been realized. Plans for this and other bold futuristic projects for Los Angeles are presented in Never Built: Los Angeles, a well curated exhibition at the Architecture and Design Museum on Wilshire Boulevard. Showing visionary works that might have reshaped the city, from buildings to parks and transportation proposals, the exhibition highlights the power of architectural ideas to change an urban landscape. Discarded projects, concept drawings and models are a window on what could have been. A vast archive of material reveals a story of a reluctant city whose local politicians and uninspired institutions often undermined inventive, challenging urban schemes. Los Angeles could have benefited greatly from perhaps a more public-minded, greener planning regime. John Lautner’s Griffith Park Nature Center (1972-1974) and the Clarence Noerenberg proposed (1926) mega-structure railway station incorporating a riverbank park would have given the city vast areas of public green space. Other projects like Frank Gehry’s unfolding skyscraper for the LA Rapid Transit Headquarters (1991) wrapped in metallic skin, rejected by bureaucrats – could have added the most adventurous building on the city’s eastern skyline. Curated by architectural journalists Sam Lubell and Greg Goldin, the show presents concepts by Frank Lloyd Wright, Richard Neutra, Paul Williams, Rem Koolhaas, Steven Holl, Frank Gehry and Jean Nouvel. Never Built: Los Angeles is on at the Architecture and Design Museum until October 13, 2013.